stand across from them. 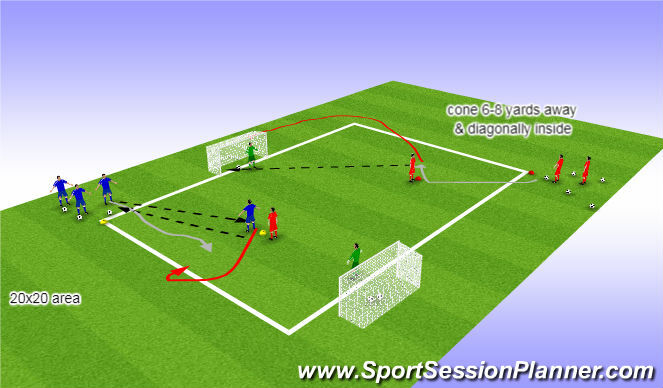 (give them cones as reference points).give them enough space in between one another so there is minimal balls being shot into others&apos; space. c. strike ball with ankle locked (flex your ankle muscles). not a wobbly foot . e. ask -when is the kick over? (they will likely say when you kick it). stress the idea of following through. Regression: physically assist those struggling with mechanics by checking their locked ankle, swing their leg to help them understand bringing it back before following through. consider bringing distance closer together if struggling with power. 2. strike with laces, plant foot pointed at target, ankle locked, body over ball, and follow through (not stopping foot on contact). 3. advanced: which part of goal is open? depending on level. can play 1v1, shoot then drop to defend 1v1. then rotate. 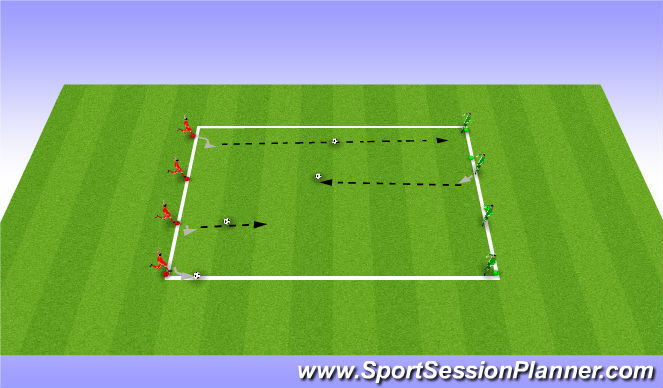 or 2v1, knock it in, knock it back, sprint wide, go 2v1 to goal. Each team sets up at one end of the field in two lines (off the field). the first two players from each line play making a 2v2 game to large goals + goalkeepers. Put a cone/flag at the centermost point which teams are restricted to. Rotate your Goalkeepers. reenforce shooting technique (toe down, ankle locked, strike middle of ball with laces) . 3. teams that get scored on: exit the game & get back in line. teams that score: get a new ball & 5 seconds countdown to shoot. Scrimmage 7v7. This is a great time to focus on GK distribution. - Show goalkeepers where they are allowed to use their hands.